Offered to the market with no onward chain is this extended and charming two bed cottage overlooking the Church and green. 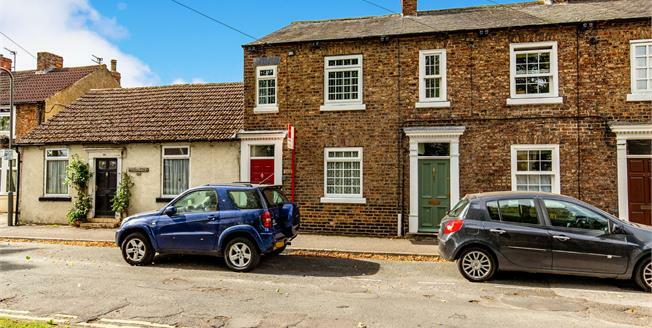 Ideally positioned in the heart of the historic market town of Northallerton. The property has been well maintained by the present owners and briefly comprises of Entrance porch and hallway, lounge, dining room, kitchen and utility to ground floor and with two bedrooms and a family bathroom to the first floor. Externally the property has a good sized and low maintenance rear garden with an abundance of character and established planting. With compesit security entrance door leading to entrance porch and internal door into hallway with storage cupboard and radiator. Double glazed uPVC window facing the front. Feature fireplace incorporating a gas fire and radiator. Double glazed uPVC window facing the rear. Radiator, under stair storage. Two uPVC double glazed window facing the side. Radiator, tiled flooring. Wall, base and drawer units, one and a half bowl sink, electric oven, halogen hob. With external door leading to garden and uPVC double glazed window. Plumbing for automatic washing machine. Double bedroom; Two double glazed windows facing the front. Radiator, fitted wardrobes. Double glazed uPVC window facing the rear overlooking the garden. Radiator, built-in storage cupboard. Double glazed window with obscure glass facing the rear. Heated towel rail, built-in storage cupboard. Low level WC, corner shower, pedestal sink.